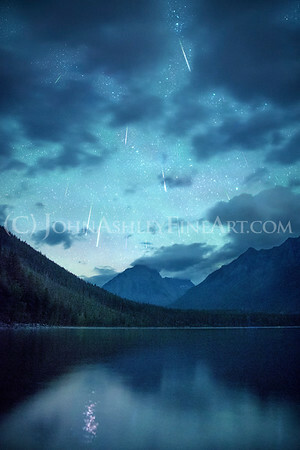 A brilliant, December meteor streaks across the skies above Saint Mary Lake, in Glacier National Park. 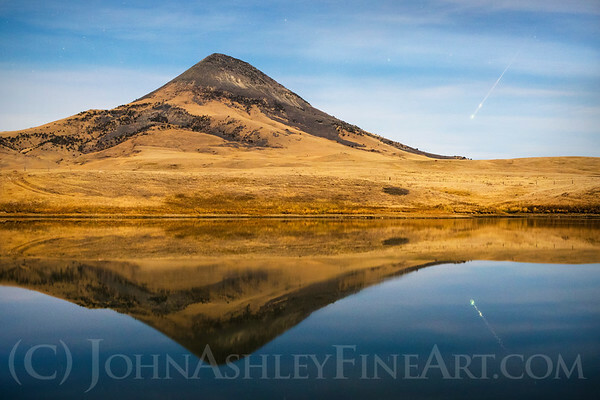 The meteor went dark above Dusty Star Mountain, or "Iszika-kakatosi" in Blackfeet, which means smoking star or meteor. This earthgrazer meteor lasted several seconds and left behind a smoke trail that persisted for at least 24 minutes. 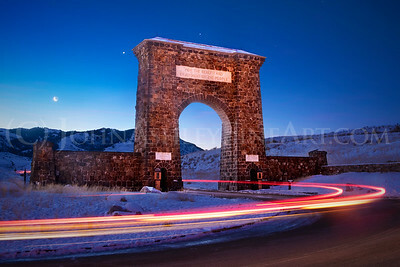 "Roosevelt Arch, Yellowstone National Park." After our Sun, the brightest orbs in our celestial view are (in order) the Moon, Venus and Jupiter. 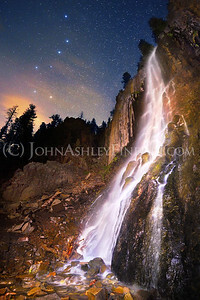 During a February dawn, it was Jupiter leading the way over the Roosevelt Arch in Yellowstone National Park, with Venus in second place and a 9% crescent Moon pulling up the morning. The quote across the top of the Roosevelt Arch is from the act that established America's national parks, reading, "For the Benefit and Enjoyment of the People." Now THAT was a bright idea. That moment between dawn and sunrise, over Great Northern Mountain in Montana's Great Bear Wilderness. 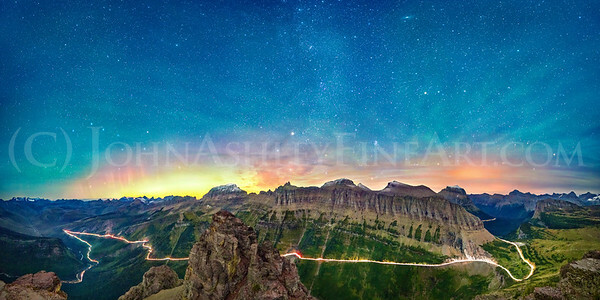 Headlights and taillights outline Glacier's historic Going-to-the-Sun Road at night while the Big Dipper rises over the northern lights. This 180-degree, east to west panorama includes (left to right) McDonald Creek, the Loop, Oberlin Bend, and the Logan Pass Visitors' Center. 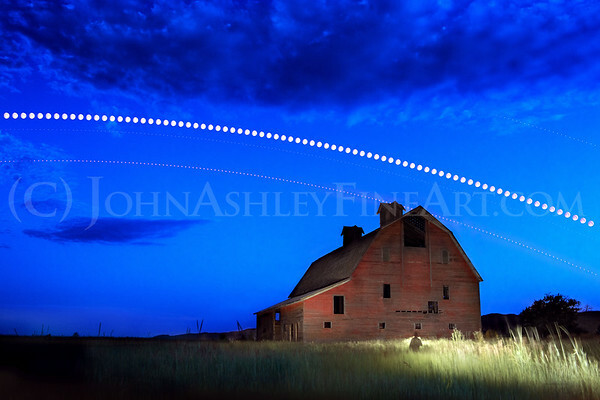 It's a 18-frame stitch (three rows of seven images) made between midnight and 1 a.m.
On the opening day of Montana's hunting season, I bagged 35 meteors between moonset (04:00) and dawn (06:30). All catch and release, of course, as documented in this composite image. Most meteors traced back towards Orion the Hunter, marking them as likely Orionid meteors — dust from Halley's Comet. Mountains in the middle are (left to right) Heavens Peak, McPartland Mtn. and Mt. Vaught, all in Glacier National Park. Montana still has about 60 rural and one-room schools in use today, but that's what's left of the 2,600 we once had. Most have faded into history. And some — like this proud marm wearing a fresh flag — are still flaking, rusting and exhaling back into the prairies. The Earth’s rotation around its north-south axis makes the stars seem to spin in circles around Polaris – the north star – above a tepee sculpture near Saint Mary. I spun my red headlamp in a spiral inside to mirror the stars and acknowledge our choice to bring the spirit above into our homes and hearts. At dusk on 24 July 2018, Jupiter (top right) and Saturn (just below the moon) emerged from the deepening blue, and Saturn (the Greek god of agriculture) accompanied a 94% gibbous moon through the night. After all three had crossed towards the west (left to right), reddish Mars rose above the southeastern horizon, clipping the Blasdel Barn on its westward journey. 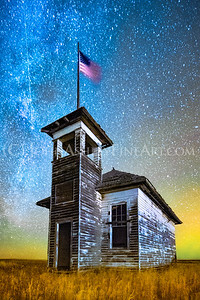 While Mars was hiding behind the barn, I used my headlamp to make a quick light painting of the faded red walls. Then — after a few hours' sleep — I added the layers together. Moon images 3:00 minutes apart, planet images 1:30 minutes apart. Frank W. Porter built the barn in 1908, and the Blasdel family purchased it in 1945. They sold it to the Fish & Wildlife Service in 1987, and today it is part of the Blasdel Waterfowl Production Area. But really it excels at producing mosquitoes. April’s full “Pink Moon” sets behind Mt. Reynolds before dawn, painting thin clouds an appropriate pink. 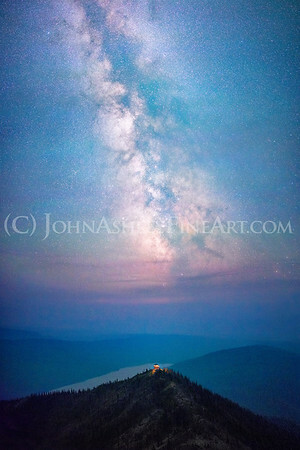 The summer Milky Way fades into a sea of smoke surrounding the Numa fire lookout and Bowman Lake in Glacier National Park. 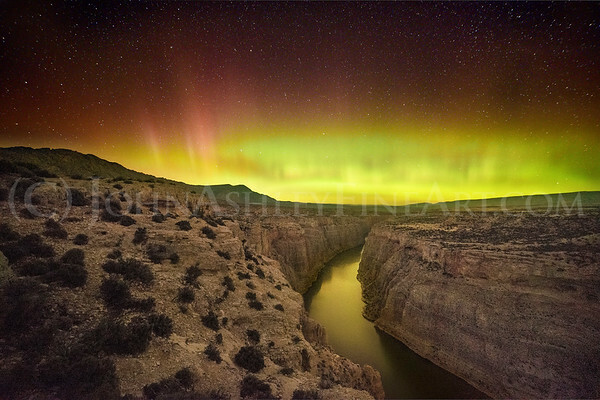 The midnight aurora reflects off the water’s surface at Bighorn Canyon, in southeastern Montana. The sun laps the moon above Mount Reynolds during an 85% solar eclipse over Logan Pass in Glacier National Park on August 21st, 2017. I knew there would be an abundance of excellent totality photographs, so I decided to look instead for some recognizable scene in Montana. I searched the state for a mountain with a slope that matched that of the sunrise and partial eclipse, settling on one of the best-known locations in Glacier. I picked this location during my scouting trip when I realized that the thin snow field would mirror the eclipse path, complete with a round "eclipse" of rocks. To make the image, I arrived before dawn to set up my cameras/tripods and capture dawn's first light on the mountain top, sans solar filter. Then I programmed the solar-filter protected camera to record images of the sun every 20 seconds, selecting those 2:20 minutes apart for this composite image. 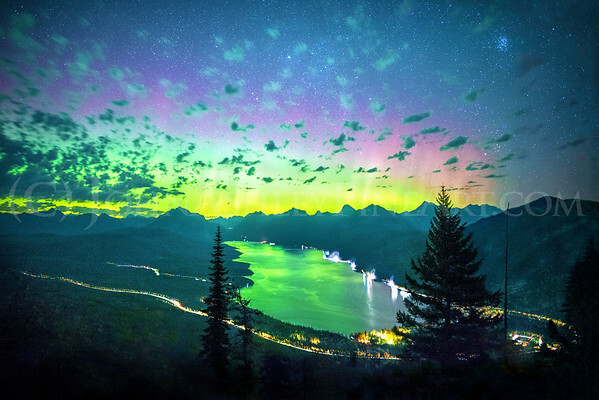 Northern lights pulse and sway over Flathead Lake and the sleepy little town of Polson, in northwestern Montana. 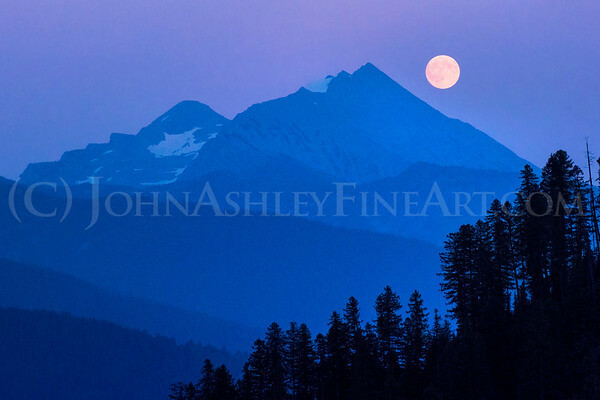 Blue dusk meets smoky gauze as Sunday evening's full moon rises beyond Great Northern Mountain (right) and Mt. Grant (left). 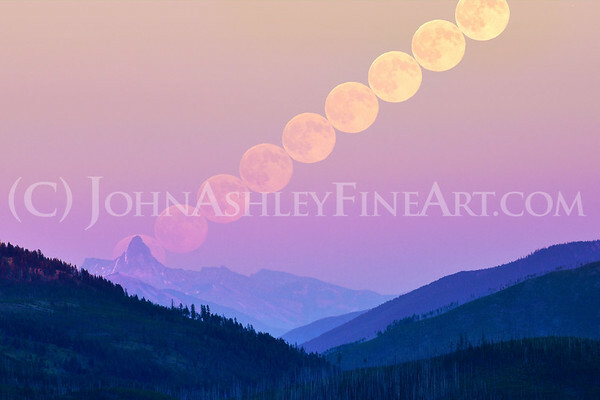 As these mountains belong to the Great Bear Wilderness, I prefer the Ojibwe name for this one, the "Blueberry Moon." 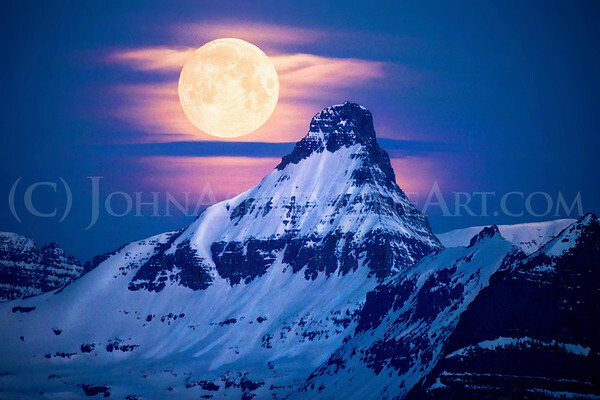 The full moon drapes over the shoulders of Mount Saint Nicholas while rising into a dusky-pink sky over Glacier National Park. 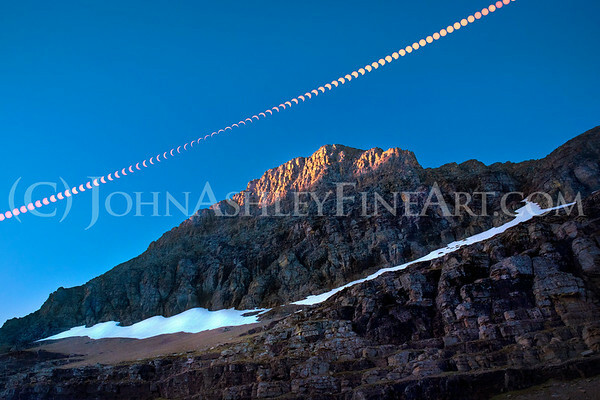 The moonrise was photographed every 2:11 minutes to make this montage. While the Pleiades star cluster rises in the east (top right), northern lights shimmer green in reflection upon Lake McDonald, in Montana's Glacier National Park. Meanwhile, the headlights from passing cars outline the park's winding roadways. If you know where to look, you can even see a car climbing up towards Logan Pass. 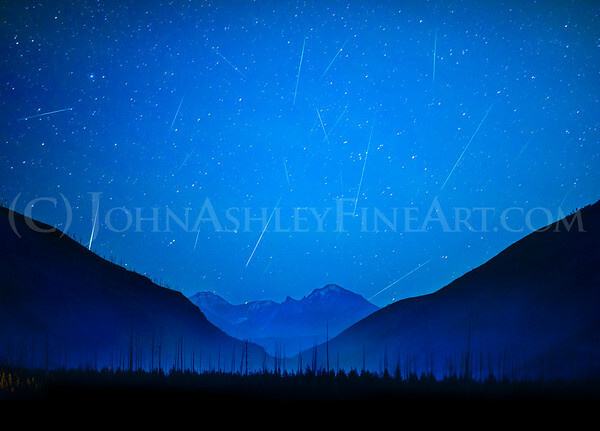 Perseid meteors burn up in the night sky over Lake McDonald after an evening rainstorm left clouds draped over the mountains of Glacier National Park. A midnight meteor flashes green in the Milky Way's dust lanes above Hidden Lake and Bearhat Mountain, in Montana's Glacier National Park. 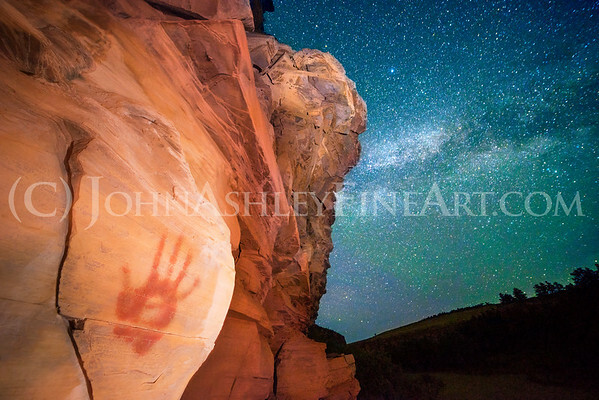 A bright meteor overpowers the full moon's light on Gold Butte, in Montana's Sweetgrass Hills. This is a nighttime photograph (5:42 a.m.) but the moonlight makes it look like daytime. 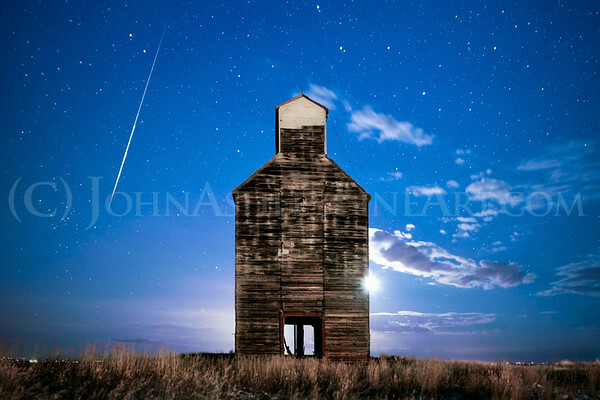 A bright meteor lights up the sky beyond an abandoned grain elevator near Cut Bank, Montana. The crescent moon peeks around from behind the elevator. The chiseled​ face of an ancient elder silently chants an evening prayer that becomes the Milky Way. 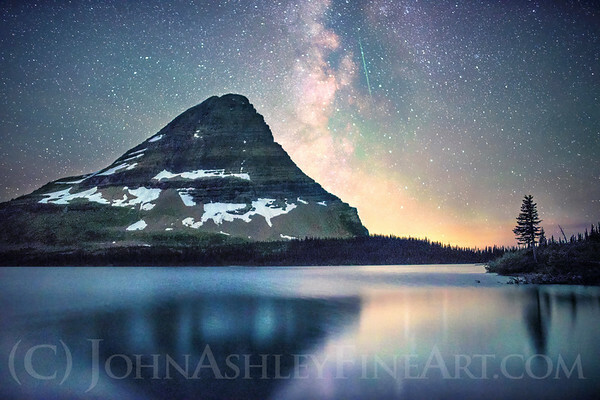 The Milky Way rises over Hidden Lake and Bearhat Mountain on a summer night in Montana's Glacier National Park. The Big Dipper pours stars into the midnight sky while Palisade Falls pours down 80' of basalt columns, leftover from a prehistoric volcano. The lights of nearby Bozeman paint the thin clouds orange. 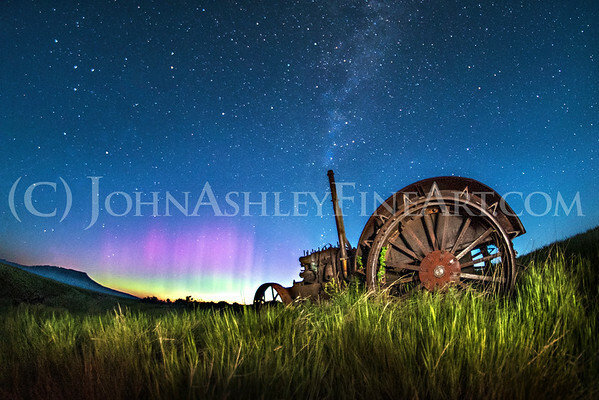 A rusting McCormick-Deering tractor watches the northern lights dance on the prairie winds at dawn near Square Butte.